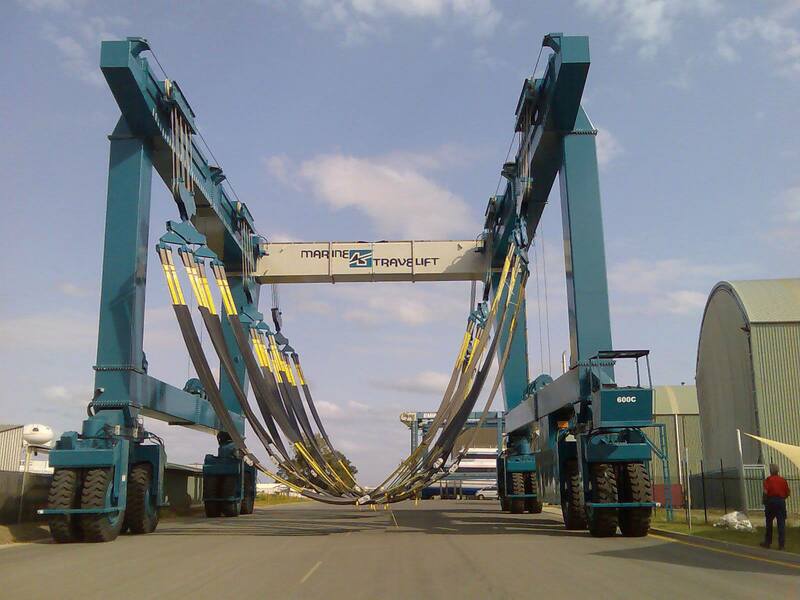 The U.S. Department of Transportation’s Maritime Administration (MARAD) has awarded $1 Million to Jarrett Bay Boatworks to support the purchase of a 300-ton Marine Travelift. A first for a North Carolina shipyard, this grant funding is part of $20 million being presented to 29 U.S. maritime operations from the Small Shipyard Grant program to support capital improvements, foster increased efficiency and economic growth. “These grants are an investment in our country’s small shipyards and will help create good jobs for America’s workers,” said U.S. Transportation Secretary Elaine L. Chao. The 300-ton Travelift will be the only one found on the south-central Atlantic seaboard, extending Jarrett Bay’s ability to haul & service some of the heaviest vessels on the water – from military craft, barges & ferries to megayachts, fishing & sailing boats with significant beams, weight & appendages that smaller lifts cannot accommodate. Jarrett Bay management anticipates the expanded capacity with a 300-ton lift will require hiring a crew of up to 25 new employees. Since 2008, MARAD’s Small Shipyard Grant Program has awarded over $183 million to more than 180 small shipyards. These grants help fund the upgrades and expansions to empower this critical industry, allowing them to compete more effectively in a rapidly changing global marketplace. By providing the capital that will let shipyards increase their repair and production footprints these grants are helping to create more jobs throughout the country. America’s shipyards support more than 400,000 jobs and contribute more than $37 billion in Gross Domestic Product (GDP) to the nation’s economy. Small shipyards vary in size but have under 1,200 production employees to be eligible for grant awards.